I tried wet sanding epoxy to 2500. It didn’t work too well. If you want glossy you’re gonna have to pour it that way. I don’t know what you used but I hear west systems makes some great epoxy. What kind of epoxy did you use? I’ve only used bar too epoxy once and tried a variety of things to repair it with little success. I just hear many speak of west systems when it comes to epoxy because it is versatile and a pretty reliable product. Yup – what epoxy are you using? Neat epoxy (sans any fillers or additives) will flow pretty well. Sounds like yours is way too thick. You can decrease the viscosity for a better flow with heat… heating the epoxy and/or substrate you are applying it to will help. Thanks for the responses! I’m using the brand Famowood. The reason i was thinking sanding would work in my case, is because I’m going for a matte finish anyway. I realize that if I want a high gloss, any sanding is going to scuff away that sheen. But since I’m going to be muting it quite a bit anyways, I figured sanding might be okay for this look. Here is an example of what some guys in town use, who use the same product I’m using. I had good results wet sanding up to 1200 then switching to auto buffing compounds. First a swirl remover than a polish. Used a HF 5” buffer for the auto compounds. There are auto compounds available that do not have silicone in them. Do you wet sand right from the start? Or do you sand it regularly with low grit in order to get it flat, and then move to wet sanding to really fine tune? I feel like getting it flat is going to take a while and using only wet sanding techniques will make the process even longer. I have poured a fair amount of epoxy and never had blotches. Lots of other problems, but no blotches. It’s not completely self leveling. It will puddle and not flow. I use a plastic trowel to smooth it out. The warmer it is in the room makes a difference in viscosity when pouring and also how quickly it hardens. I don’t like brushes because you will wind up with bristles embedded in the epoxy. Epoxy is a merciless teacher. Easy to make mistakes and very difficult to clean them up. If you want something other than high gloss finish, I use spray lacquer over it for my sheen. imo, wet sanding would be the way to go-using backing blocks to make sure the surface gets flat and sanding in different directions for each grit. sand in an ////// direction with one grit then\\\\\\ for the next. that helps to see that the scratches from each grit has been removed. you can keep going down( or is it up?) in grits until you achieve the sheen youre looking for. sandpaper grits go up to( or down to?) some seriously fine grits, which get called polishing paper after a point. personally id start with 800 grit and see how that cuts and flattens. its easier to go down( or up?) to 400 if it isnt cutting fast enough then the other direction. IF there is anywhere that could possibly sanded through to bare wood, i would stick with dry sanding. I was able to achieve a consistent matte by sanding with higher grits. I just couldn’t get any better than that. I use micro mesh 5 in. discs to get a good polish. Once you get it flat, you are looking at a lot of work. Stepping through 1800 grit, 2400 grit, 4000 grit, 6000 grit, 8000 grit and finishing with 12000 grit. (No joke) Then applying a finishing compound. Polishing compounds do something similar, but with less finesse and control. I know you said you want a matte finish, but if you want to take it to a shine, lots of elbow grease is required. Depends on what “blotch” means. Are you getting amine blush? Fisheyes? Might be best to post some pictures. There are lots of things that can cause finish issues with epoxy, especially in shop and garage environments. Lots of surface contaminants can easily be deposited on your work, many people mix epoxy in containers that were previously used for all kinds of nasty stuff and then wonder why their epoxy looks like a train wreck. 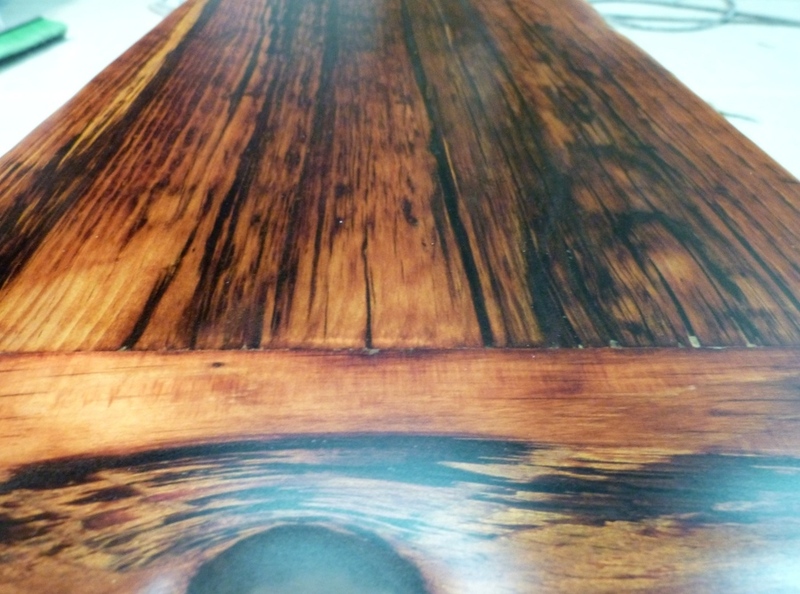 Oily hands, leaky compressors in the shop, spraying varnish or laquer nearby, porous or open-grained woods (like walnut) can cause air bubbles, even furniture waxes and car polishes—I’ve seen a million different things cause finish problems for epoxy over the years. Sometimes guys use a propane torch to get rid of bubbles, but don’t use it well, and they scorch the epoxy. Some people mix their epoxy incorrectly and get too hot of a batch, or heat the part A too much (or heating the part B at all!) to make it flow better and the batch smokes as it cures – definitely going to get an ugly finish in those cases. As for sanding, it can be done, but as mentioned above, it’ll take a fair bit of work, and you’ll have to go into some very fine grits and then polishing compounds, otherwise the finish will look dirty or hard to see through, sometimes hazy. If you r seeing trowel marks it could be that you are applying it too thick or is too thick to begin with. I would think that the blow torch or better yet a heat gun would be your best bet right after applying your third coat to get a smooth surface. I use either Total Boat or West System epoxy and have never had a problem. I’m wondering why you used a Walnut slab if you want a matt finish on the epoxy. You could have built it out of MDF if you don’t want to see the grain. I m wondering why you used a Walnut slab if you want a matt finish on the epoxy. You could have built it out of MDF if you don t want to see the grain. I think he means flat vs glossy, not opaque.